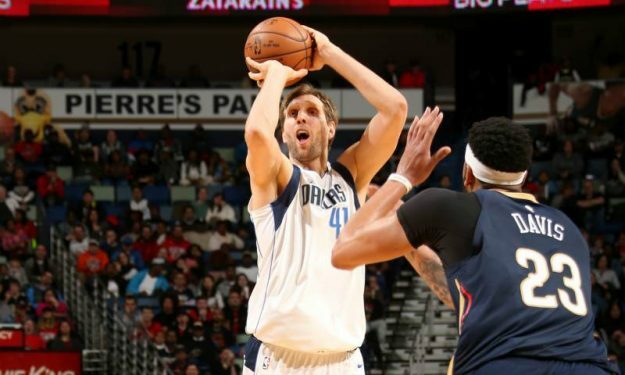 Once more Dirk Nowitzki will demonstrate his ability to shoot the three in the All-Star Game. It was already reported, but now it’s official. German icon Dirk Nowitzki will take part in the All-Star Game three-point contest. Per the NBA: Defending champion Devin Booker of the Phoenix Suns and former champions Stephen Curry of the Golden State Warriors and Dirk Nowitzki of the Dallas Mavericks will participate in the 2019 MTN DEW 3-Point Contest on Saturday, Feb. 16 at Spectrum Center in Charlotte, North Carolina. Meanwhile, Serb Nikola Jokic, Montenegrin Nikola Vucevic and Slovenian Luka Doncic will compete in the skills challenge. Per the NBA: First-time NBA All-Stars Nikola Jokić of the Denver Nuggets and Nikola Vučević of the Orlando Magic and reigning Kia NBA Rookies of the Month Luka Dončić of the Dallas Mavericks and Trae Young of the Atlanta Hawks will display their vast array of talents in the 2019 Taco Bell® Skills Challenge on Saturday, Feb. 16 at Spectrum Center in Charlotte, North Carolina.